Moving from on-premises to the cloud is one of the most important decisions that enterprises face today. If you decide to move your business to the cloud, your first task will be researching to find the best enterprise-grade Infrastructure-as-a-Service (Iaas) or cloud platform to meet your company’s requirements. 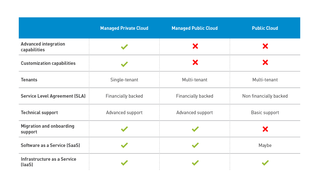 Amazon AWS, AZURE™ from Microsoft®, Google®, OpenStack® and VMware are the five the top options when it comes to enterprise-grade IaaS and Intermedia for managed private cloud solutions. In this article, we will explore the pros and cons of each to help you decide which one is right for your business and introduce the concept of Private Clouds. All five of the leading cloud platforms have similar core features—Compute, Storage, Databases and Networking—with powerful analytics and multiple deployment options. However, analysts and industry experts agree that AWS has the most mature IaaS offering and offers the broadest range of services. It also excels in breadth of security, reliability, and compliance. AWS serves both start-ups and enterprises well and has a growing percentage of midmarket businesses. The capabilities of AWS coupled with its mature infrastructure services and vast ecosystem of partners, who help to attract and retain customers, make it the best fit for DevOps. Are you in a regulated industry or work with government entities? AWS GovCloud is an isolated AWS region designed to allow the U.S. government and its customers to move into the cloud by addressing their specific regulatory and compliance requirements. While AWS doesn’t offer developer tools, many of the services available in AWS are comparable to Platform-as-a-Service (PaaS) offerings. You can use the platform services available in AWS without having to create or maintain your own application servers. Azure is the best choice for companies that have deeply invested in Red Hat solutions. With Azure, applications can run on both local servers and in the cloud. Azure also works with certain flavors of Linux, notably SUSE and Oracle. Companies looking for a PaaS that provides developer tools prefer Azure (which blurs the lines between IaaS and PaaS) and Google App Engine™. Additionally, Microsoft’s corporate customers benefit from Azure integration with Microsoft’s offerings, which can save money in deployment. Google, one of the leading early PaaS vendors, now has IaaS services. Its commitment to cloud platforms is paying big dividends in sales and growth. With good reviews in recent analyst reports, Google is boosting its reputation among coders and DevOps. Upon adding Google Compute Engine™ in 2014, Google became an option for DevOps pros, a group it previously didn’t serve. However, Google Cloud Platform™ lacks several key certifications, security controls and application services that are important to CIOs. Many people may choose AWS or Azure instead, as those two cloud platforms provide their customers with such benefits. Related Article: Head in the Clouds: Can Your Business Fully Operate in the Cloud? The other two major options are OpenStack or VMware. A large number of companies using VMware are concerned about the expense wonder if, and how, the open source OpenStack can help. However, comparing the two is like comparing apples to oranges because they have different product offerings: VMware is a virtualization solution and OpenStack is a cloud software platform. OpenStack is one of the most popular options today due to its open source nature and is considered a serious rival to AWS. However, while OpenStack software is free, it requires high-end skills to implement due to the complexity of its installation process and operation. Additionally, there is currently a shortage of OpenStack engineers, so the cost of training your IT staff has to be taken into account, along with the cost of their community support model. The license costs of VMware are high, but VMware only requires basic system administrations skills. VMware stands out as the virtualization leader due to the reach and maturity of its virtualization solution and large partner ecosystem. If you already use VMware for virtualization and the entire infrastructure in your office is built around VMware products, vCloud Director® will be the most appropriate choice. vCloud Director is a platform for deploying clouds developed by VMware, and the system enables the building of hybrid clouds. What about the price? It’s difficult to make a recommendation for the best cloud platform in terms of price. The amount of variables, primary interest and list of requirements are so large and dynamic that it is very difficult to make comparisons. However, Microsoft and Amazon are very transparent in pricing their services. Having said that, Amazon has brought a low-margin retail mindset to its overall pricing strategy, and the cloud IaaS industry in general, benchmarks its pricing against Amazon AWS. The company has a policy of providing frequent price drops with a disciplined approach to discounting, and offering a lower prices if there is commitment to a certain minimum spend. Amazon’s strategy is to offer a low price to prevent this factor from being a real impediment to adoption, while growing its service portfolio at a rapid pace. Amazon is able to get customers in the door with minimal friction and upsell them on services that are both stickier and much less price sensitive than base infrastructure. Although AWS is facing increased competition, particularly from Microsoft and Google, and is primarily an IaaS-only solution, it still remains a thought leader. However, there is no silver bullet, and even the best IaaS platform may not satisfy all of the necessary requirements for your enterprise. Since cloud platforms are the keys that unlock the productivity and financial advantages of cloud computing, this decision, no matter how you look at it, will be a compromise. You want to make sure you have made the best possible choice in the very beginning. For this reason, it is recommended that you work with cloud vendors who can analyze your needs and build a custom-made and fully managed Private Cloud that provides a higher level of flexibility and customization than a non-managed infrastructure-as-a-service platform.